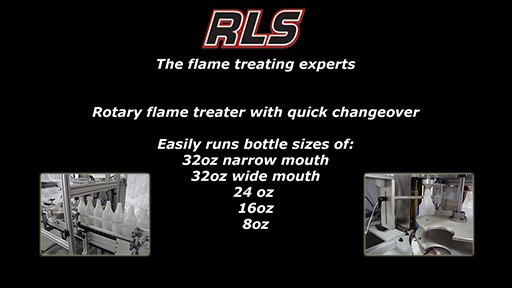 RLS has designed and sold many rotary index flame treaters with the ability to flame treat multiple sizes of plastic round bottles. The system can also accomadate multple neck finishes of differet sizes with little to no changeover. The system is designed to run up to 30 containers per minute. The specs below are for our most popular model, but machine can be made to customer desired bottle specifications. The product enters into the RLS flame treating system on a new table top chain conveyor. The product will enter into a pocket starwheel. Once completely inserted in the starwheel the unit will index. Once indexing the top nose cone equipped with double bearings will lower down onto the center of the product and the lower plate will then begin to rotate. Once the proper rpm is achieved, the flame gate will automatically open and flame treat for “X” amount of revolutions. Once the flame treat period is completed the nose cone will retract, the wheel will index the next bottle into position, and place the pretreated unit onto the existing exiting conveyor. The system will be capable of being changed over to run any of the 5 diameter bottles. The unit is an enclosed guarded system supported by a frame equipped with leveling legs that can be mounted to the floor. Four swivel casters. Legs must be turned up to sit on the casters. Table top chain conveyor. Six feet in length, six wide 304 stainless chain with a variable speed ac drive capable of 100 fpm. Dead plates for transfers at both ends of the conveyor. Servo index system located above the conveyor system to drive the starwheel. Starwheel pocket fabricated from aluminum and split in two halves for easy change over. 8-4” adjustable high precision drilled and ported ribbon burner equipped with a mixing system and precision needle valves for air and gas flow. Adjustable mount to raise and lower the burner 0 to 4” from the base of the bottle. Air and gas system equipped with flow gages for set up and to assist in the repeatability of tuning in the system. The on / off ignition system will be supplied by a high voltage transformer. A Honeywell thermocouple or UV mini peeper sensor will be linked to a flame detection circuit. AC variable speed drive for the rotating base. The top bearing is an anodized aluminum nose cone that has double bearings that will center the product to ensure concentricity while spinning in front of the flame. The system is controlled by a PLC housed in a painted Nema 12 enclosure on the side of the machinery. Control panel HMI is located on the right side of the machine as you view from the discharge end. The guarding is a double stainless steel shroud around the burner section of the machine. System has a rated capacity of approximately 30 containers per minute. There is a low-level eye that will ensure and adequate supply of bottles in the infeed for adequate pressure into the starwheel. A high level backup photoeye that is mounted down stream after the discharge of the index wheel. Should this eye become blocked the unit will automatically shut off until the eye is unblocked. Once the eye is unblocked for a given amount of time, the system will begin to flame treat as previously specified. System manual which contains a print out of the program, copy of the program on disk, electrical schematics, burner set up instructions, general machine operation, and recommended spare parts. Bottle gating mechanism at infeed of star wheel to hold back product should a low level occur. Star wheel will always clear itself out if a low level occurs so no bottles stay in front of the flame door.